For an upcoming Princess Cruise Line sailing that we booked, we wanted to take advantage of Carnival Corporation (parent company of Princess) Shareholder benefit of additional OBC (on-board credit). 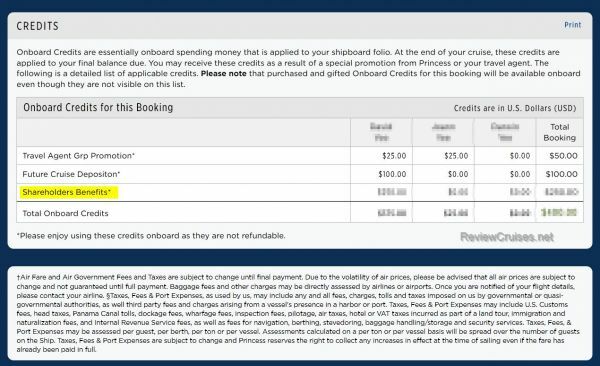 You get $250 for sailings of 14 days+, $100 for 7 to 13 days, and $50 for 6 days or less if you are a CCL shareholder of 100 or more shares. Unfortunately since we just bought the stock a couple days on February 1, 2018, the January brokerage statement did not include that transaction. A screenshot of our current brokerage portfolio would likely not suffice as well, so we tried sending in the trade confirmation as proof instead, even though it wasn't listed. It worked without any problem, and showed up alongside with our existing OBC that we received from the promotion our travel agency ran when we booked. Download the trade confirmation as a PDF file from the online site of our brokerage. For security reasons you might want to cross out the account #'s and any other sensitive info first using a PDF editor. Word or Photoshop (even Photoshop Elements) should work. Personally I used the Drawboard PDF app from the Windows 10 store to edit the PDF by highlighting the line showing Carnival shares, and then using the pen tool to blot out the account number. If you can't edit it directly, you can print it out, take a photo of it in your smartphone, then edit the picture with a free photo editing app, saving the resulting .JPG file. If you will be using Faxzero, be sure to save just the relevant pages, up to 3 pages, excluding the cover letter. Use FaxZero.com to send the fax for free. Paste in the cover letter text from step 3, browse and attach the trade confirmation PDF or JPG file, then click "Send Free Fax Now". I had PDFs rejected by FaxZero with the error message that "has one or more files in a format that we cannot open", but JPG images always went through fine. Confirm the fax request in your email account, and within a few minutes you should get another email saying the fax was successful. Hope this helps! We're hoping the CCL stock will hold up during this period crazy stock market volatility, lol.